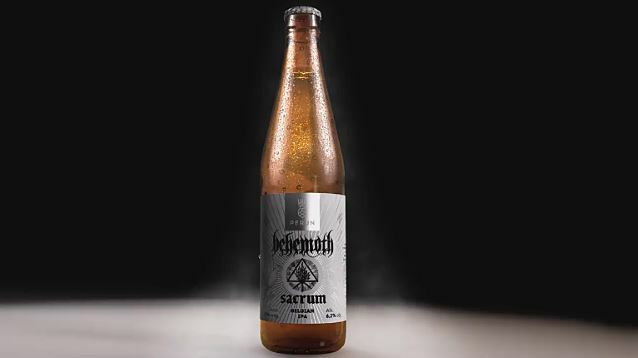 Polish extreme metallers BEHEMOTH have collaborated with Polish brewery Perun on the band's own brand of beer, dubbed Sacrum. With 6.2 percent alcohol by volume, this Belgian IPA-style ale will be available on May 11. A video clip promoting the Sacrum release can be seen below. A number of other bands have previously expanded their brands to include a signature beer. Among the most recent ones is MASTODON, who teamed up with Signature Brew in the U.K. to create Mastodon's Black Tongue, a brew that is an 8.3% double black IPA and was called Signature Brew's "biggest and most powerful creation to date." IRON MAIDEN famously released its Trooper ale, with its malt flavor and citric notes with a subtle hint of lemon. AC/DC's beer was a German premium lager called Australian Hardrock, which promised to "fire up your tongue like TNT." MOTÖRHEAD came out with Bastards lager, which was described as "a fruity beer with a wonderful character of light malt." PEARL JAM's Faithfull Ale, whose release coincided with the 20th anniversary of the band, was a Belgian golden-style brew that came with 10 incremental additions of black currents. SEPULTURA's signature Weizen beer contained "the aroma and flavors of banana and clove," while MUNICIPAL WASTE's Toxic Revolution was a signature oatmeal stout. AMON AMARTH offered the honey and smoked malt Ragnarok Porter, while CORROSION OF CONFORMITY came out with Corrosion Of Conformity Imperial Porter, which is aged in a rum barrel while boasting a raisin base.